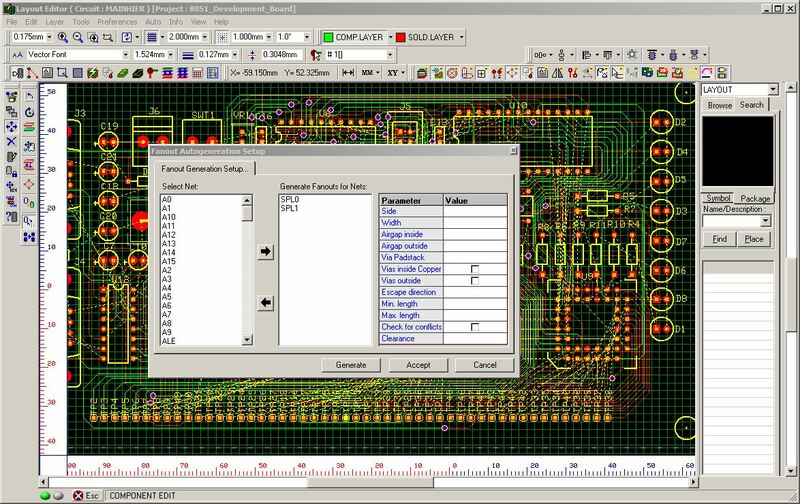 Layout Editor is used to design the PCB layout of a circuit. 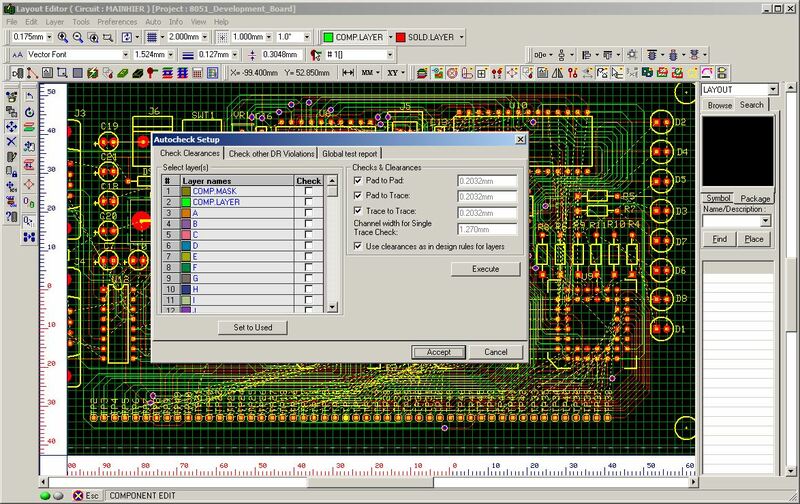 The design can be captured either in Schematic Capture or directly in Layout Editor. 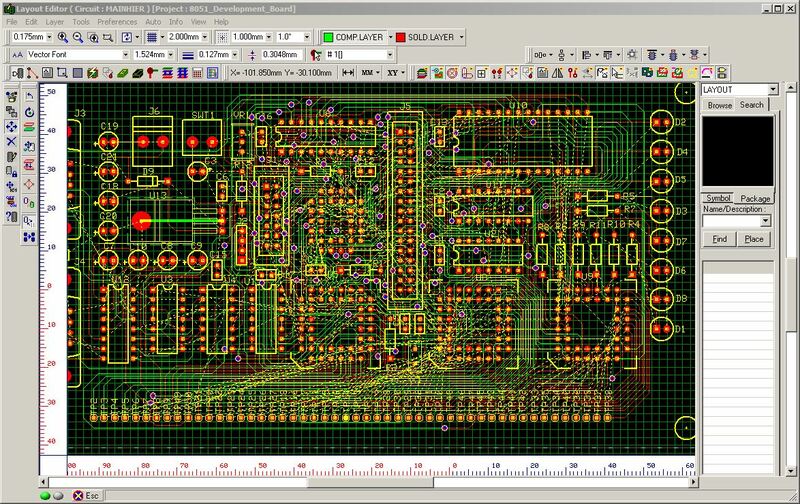 In the former case, the design is Front Annotated to the Layout Editor and in the latter case it is Back Annotated to Schematic Editor. Also allows beginning layout without a preexisting schematic. In layout the components are placed using Library Browser or Library Explorer. Each of the components placed is labeled which displays information about the package. 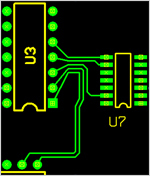 The component pins are connected using Trace or Nets. Automatic operations like DRC Check, Renumbering of Components, Placing Components and Routing is also possible from within this editor.The components may be autorouted using Arizona autorouter, which is an integrated module of EDWin XP/2000. SPECCTRA Translator supports different options like Converting EDWin XP/2000 Project (database) to SPECCTRA Compatible Format, Importing Results from SPECCTRA Autorouter and Autoplacer etc. MaxRoute Translator allows to convert EDWin XP/2000 layout project (database) to a form that is acceptable to MaxRoute Autorouter and MaxRoute Autoplacer. Once when a design is complete, necessary notes may be added by selecting appropriate tools. This Editor also allows editing Already Existing Projects. Other by auto router wiring, performs the wiring with rip-up function, you can output such as Gerber / drill data and parts center coordinate data of the substrate. The equipment of tools such as parts and auto-layout and fan-out analysis and wiring density display, solid surface and teardrop automatic generation ·3D viewer , can be more complete board design. 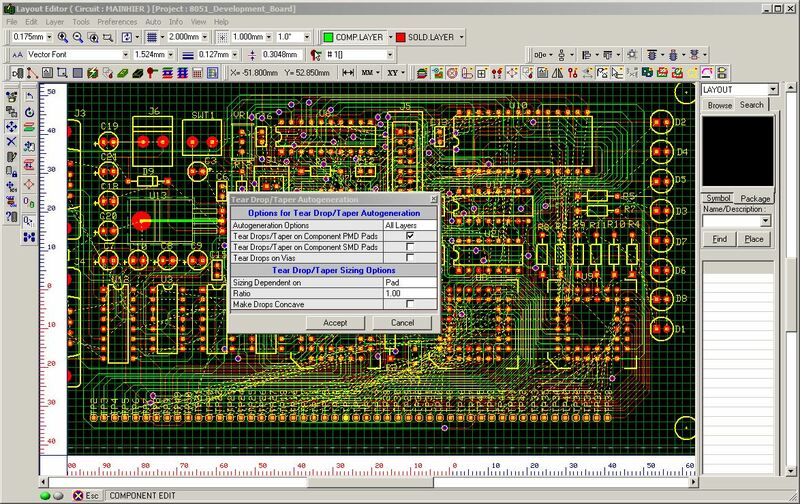 In input use of mechanical CAD output outline DXF data, substrates of complex shapes, can be easy layout. 3D viewer of standard equipment, can be confirmed from each direction in a three-dimensional, including the housing not only the substrate, also available in the document. The Plus Pack, included with the board thermal analysis to check the temperature of the environment. 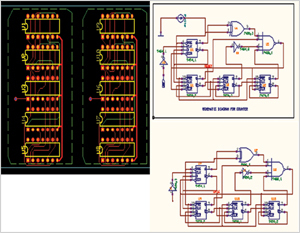 Plus + in the pack, I have added the electromagnetic field analysis and signal degradation analysis that enables a more detailed board simulation. Copying attaching a schematic block, with the exception of the net which is not connected in a block, immediately is reflected in the layout. 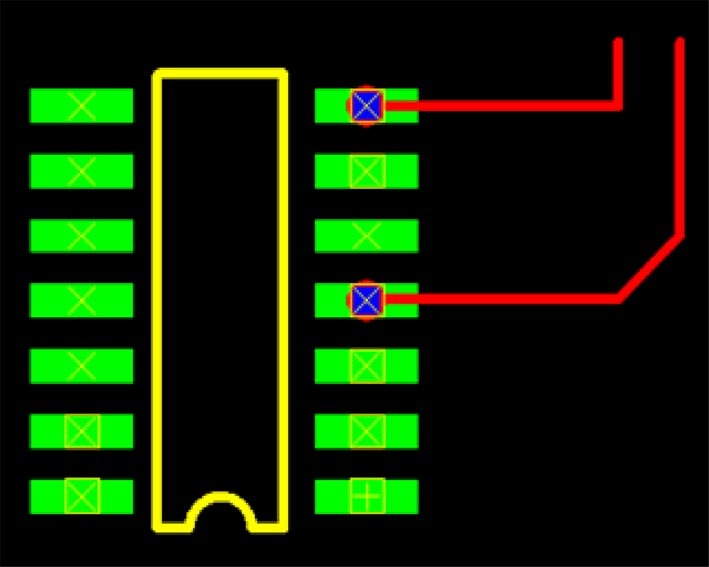 Similarly, when a layout block to copy pasting, it is reflected in the circuit diagram. Since such anti-noise and impedance matching, if necessary parallel pair wiring arrangement, by specifying the net connection destination to specify wiring criteria for each start pad pair wiring, and parallel up to 8 wires You can automatic placement. Connection destination of each net other than the reference net I can be connected by a drag operation. And by a smooth arc wire, issues a high frequency portion of the wiring and the wiring density is reduced. Was partially or narrow or wide the wiring width, current measures and wiring density, etc., to improve the degree of freedom in design. By the setting of partially wiring length / width, you can generate the wiring that was the rule of. Check the resistance-capacitance-Indatansu impedance after wiring, it is also possible to modify. The layer structure is designed, and assigned the layer type (PWR / GND, signal or mixed), the conductor layer thickness, by setting a such as an insulating layer thickness and parameters, can be automatic generation of impedance of stripline and microstrip wiring that desire is. I want to facilitate the wiring to the SMT components. The auto-router that exert an effect on the logic system wiring, I have been standard equipment. DRC check, between the pads between the pattern pad - Check the inter-trace. Based on the set design rules, do the automatic correction of the defective part. Set the current capacity of each net, can be wired in the optimum pattern width. It will automatically generate a teardrop to increase the pad strength.